I am Dr Pramod Chinder and I have set up this campaign for my patient, a 12-year-old boy named Farhan. He is diagnosed with osteosarcoma of the leg and is under my care since late 2015. Unfortunately, he had lost his right hand in an accident in his early childhood. Though it became all the more important for us to save his leg. Considering on the standard lines of treatment we put him on chemotherapy before we planned a limb saving surgery. He is not able to continue the treatment because of financial issues. 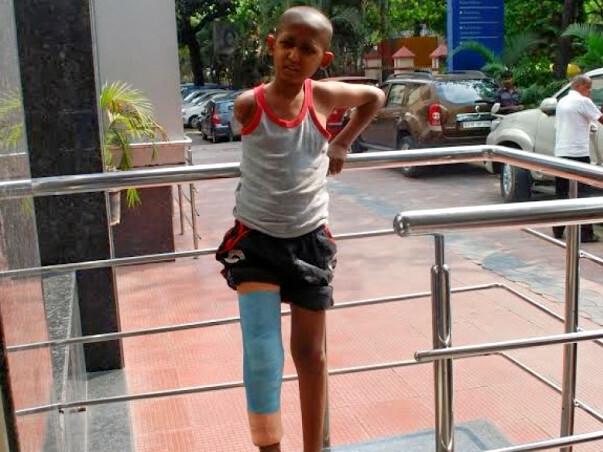 This is very critical for this boy to survive after this treatment. It would be great if we can get any contribution . Frahan needs to complete his treatment and it is very crucial that his cancer is under control. Nearly 8 lakhs would be needed to complete chemotherapy and to get a prosthesis ( an artificial device that replaces a missing body part). Your contribution will make a huge difference in his boy's life. He is now back home in his village. Funds collected will be utilised to cover his bills and I will ensure you receive regular updates on his progress. You can donate via Cheque too. Enter the amount you wish to contribute and click on 'Donate Now' option. On the next page, choose 'Cheque' as a payment method and follow the steps. This is Dr. Pramod Chinder, Farhan's doctor. Thanks for the generosity and prayers. 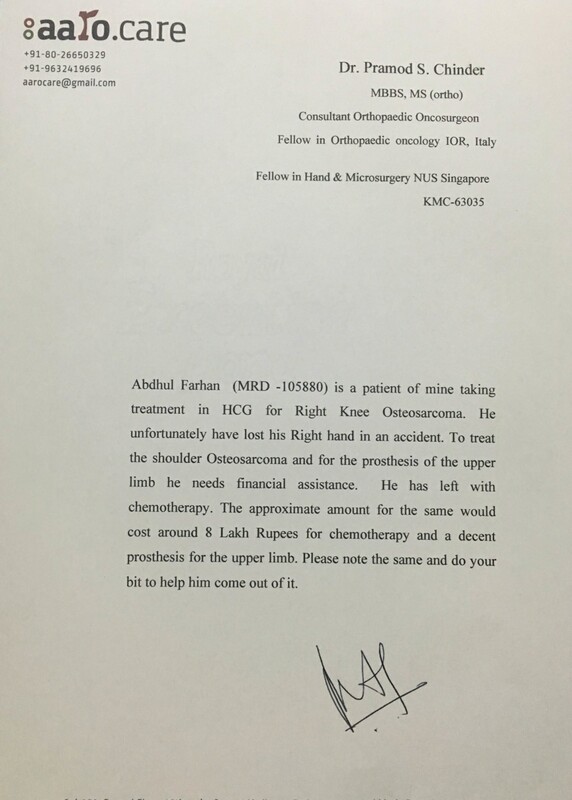 Farhan is taking radiotherapy for the affected parts to ease pain. I visited him at his place as he had difficultly to move. Was happy to see him smiling as always. He is a fantastic kid. Things are not going as planned for him. His disease has worsened and spread to other parts of the body. It is difficult to see him go through such a phase in this young age. The family has personally expressed their gratitude to you. Your support has given them relief in this difficult time. Do keep him in your prayers. I will keep you posted about Farhan. We have an update from Farhan's father and his doctor. Farhan underwent the first surgery last week. His cancerous tumour has spread to other parts and especially his lungs. This was serious problem and doctors had no option left but to remove the affected portion of his leg, otherwise it would be dangerous and would be a risk to his life. He is recovering well and is visiting the hospital on the Friday (July 1st). His father said he is having some pain in his arm as well but is staying strong as he always is. He got some financial support from his relatives and the surgery was completed. 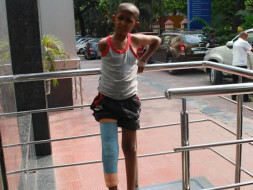 The next step is to get Farhan a prosthetic leg. We will keep you posted after speaking to his doctor on the next course of treatment.